You may be familiar with the ethical dilemma about killing baby Adolf Hitler. Perhaps not to this degree of specificity, but I do know of a general wish to be able to travel back in time, in order to change, or “fix”, history. As far as I know, that’s not happening for awhile. Instead of wishing for the (currently) impossible, let’s take what control we have left over history: how we share it and how we learn from it at present. For instance, education. Textbooks themselves are terribly out of date, and so are the methods which teachers usually employ to explain them. In Social Studies, I use a textbook last updated in 1995, and studying in Canada, that means that it was released before the last residential school closed its doors. While there is a general acceptance within my class that Indigenous peoples were wronged, there has been little attempt to prove this with concrete historical evidence, or to connect it with current events, such as the murders of Colten Boushie and Tina Fontaine. This isn’t the fault of one teacher, or one publishing company, but rather a glimpse into the much larger issue around what we teach our students, and how we teach them. It’s difficult to establish material that is accurate, teaching methods which are creative, and steps to take, which connect learning to today’s world, yet all those elements should be a given in a history class. Above all, encouraging critical thinking is a must, and goes a long way to shaping students who are engaged citizens, both now, and as they age. Bottom line, we also have a responsibility to rewrite history in a way that is unbiased, respectful, and representative of everyone involved. Part of this process thus should include all of these groups of people in the formation of the resource; in a sense we must “reright” history, as well as rewrite it. This would go a long way to ensuring fair representation of all parties, and bring those who may have been historically divided, together, fostering collaboration and a sense of hope. Rewriting history also calls into question the ways in which we will represent our present to future generations; it is not enough to simply try and make our history accurate. To do so, we need to write about our present wrongs, and take steps to actually right our wrongs. Consequently, the next world leaders will be able to learn all they can from our flaws and mistakes, which we will have held ourselves accountable for, and from our successes, which we will have recorded. Let’s reright history, write our wrongs, and right our wrongs before we become history. We would like to acknowledge that our understanding of history will never truly encompass the multifaceted events that have occurred in our world. We know that this limits us in many capacities, yet we intend to do whatever we can to share a correct, inclusive, and didactic version of history. We invite you to join us, whether that is through protesting inaccurate representation, advocating for changes in the education system, or encouraging those around you to consider a variety of perspectives. What does one do when on vacation in Las Vegas? Attend a rally against gun violence, of course. Over 5,000 people of all ages came to the March For Our Lives rally in Las Vegas in order to express how incredibly sick they are of people they love, being taken from them as a result of gun violence. To some, it may not seem like a rally can make a difference, but if anything, the unity and compassion shown at the rally in Las Vegas is a telltale sign of change being made. The fact that anything at all was being done about the countless shootings in the United States after, years of sitting back and watching it happen, was empowering. The rally released pent up frustration, pain, grievances and resentment, and was an incredibly potent example of youth activism, togetherness, peaceful protesting, intersectional activism, and effective usage of privilege. The fact that these rallies were organized by youth is inspiring, especially to people like myself and many other young people that I know. I personally felt a spark of empowerment when I saw black girls around my age, leading chants and walking in front of a sea of people marching for their lives. There are millions of children, teenagers, and young adults watching as countries get bombed, children get shot, people get discriminated against, and injustice continually surrounds us all. We are told we can change the world, but as we sit back and watch it crash and burn, many of us don’t know where to start. The students at Parkland, as well as the numerous other young people around the world who fight for a better future, give me hope. They remind me that we are powerful, we are competent, and together, we can make a change. At the march, my father embarrassingly made me take a photo with two complete strangers. After the photo was taken, I told them that I was on vacation, and that I was from Canada. They immediately reached out to hug my father and I, and thanked us for showing up and supporting them. This is a perfect example of what my experience at the march continued to be. 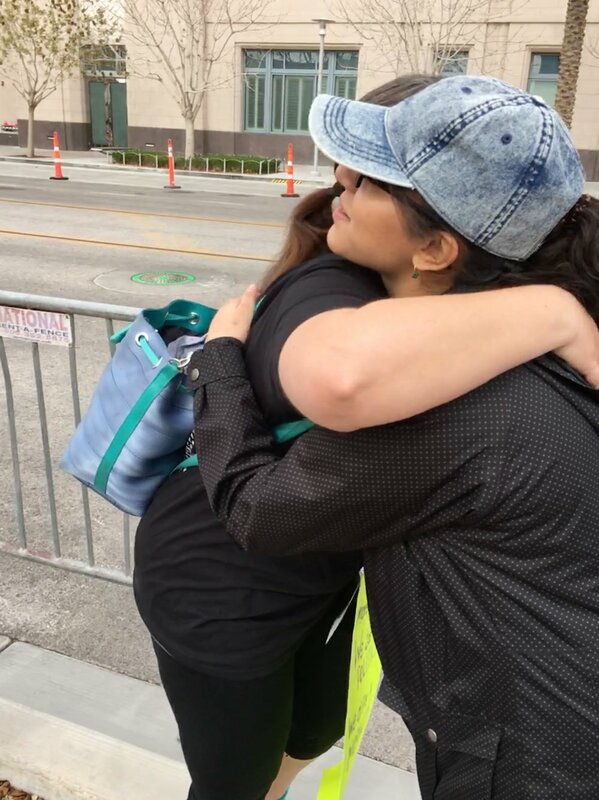 People (and animals, specifically dogs) of all ages, genders, physical appearance and walks of life smiled at each other, hugged one another, and called for action together. This event connected people from across America. It hit close to home, allowed people to truly empathize with one another, and created an atmosphere of hope and perseverance. This kind of connection alone is a magical thing that seldom happens in our world; I felt honoured to be a part of it. I was moved to tears by the intersectional activism that was presented at the march. I watched as in his first speech of the day, the young man on the megaphone screamed that this march was for the black and brown people who have been gunned down in the streets of the United States, and have not been acknowledged. This was an absolutely crucial part of this rally. March For Our Lives was an event against gun violence, and as mentioned multiple times throughout the rally, black people, brown people, and women are most often victims of gun violence, yet these incidences do not go recognized or acknowledged. As a result, gun violence against minorities have become a norm in American society, and the March For Our Lives rally recognized that this is absolutely unacceptable. This recognition is an example of people utilizing their privilege in order to be a voice for those who are not given one. The majority of youth originally involved in organizing the March For Our Lives movement were white, and they used this position of power to spread awareness about the minorities and other groups who are victimized more than most had previously realized. March For Our Lives was an incredible event, but it is important for us all to recognize that it wasn’t just a moment. Many will not stop until something is done about the atrocious amount of gun violence occurring in the United States. Over 4,000 people registered to vote across America at the rally, which was a result of the emphasis on democracy that was clearly displayed through the rally. Voices will be heard, because as we called together: this is what democracy looks like. For our highlights of March For Our Lives Las Vegas, check out our Instagram @livehopelyfe! We would like to express that although this event was an incredible success, many still are not given the privilege to have their voices be heard. We would like to acknowledge this, and send our love and support to those who cannot speak up, for whatever reason that may be. We would like to recognize that violence in general is a complex and multifaceted issue, and that it exists everywhere in the world. Please join us in trying to do our part in using our privilege to spread peace, understanding, love, empathy, and hope. MEASURE U.P. began as a way to get around doing a science fair project; we knew that we weren’t as passionate about traditional science as we were about social sciences, and wanted to create something that was more geared towards our interests, including poverty reduction. As a result, we utilized our previous knowledge about the UN Multidimensional Poverty Index, as well as our observations, to investigate and expand upon the concept of measuring urban poverty. Poverty is a multifaceted, vicious cycle that is not only about income. Those living in poverty are often trapped within it, both by stigma and by the many deprivations with which they are faced. The United Nations’ World Bank set the international poverty line at $1.90/day, or $13.30/week, when the reality is that this is hardly enough for households living in rural poverty, let alone in urban poverty. In addition, urban poverty is seldom measured in a way that comprehensively and multidimensionally examines poverty , and instead focuses on its monetary aspects. While the UN’s Multidimensional Poverty Index (MPI) is used to measure the indices of over one hundred less developed countries around the globe, the contributing indicators are all very basic—they cannot be applied to populations living in urban poverty, especially those in more developed countries. MEASURE U.P. seeks to multidimensionally measure urban poverty, by creating ten more applicable indicators and modifying the UN MPI formulas to fit them. Specifically, two education, three healthcare, and five living condition indicators were researched, analyzed, and proven to form a comprehensive picture of urban poverty in more developed countries. Furthermore, this project seeks to utilise proposed indicators to develop the structure for an organisation called HELP U.P., which would connect urban companies, industries and inhabitants with urban poor in need of loans. Modeled after successful microfinance social enterprises such as Kiva, and investment companies such as CircleUp, organizations like HELP U.P. could play a large part in the future of Canadian poverty reduction. If founded, HELP U.P. would put indices into practice, raise mean levels of proposed indicators, allow companies to engage in community betterment, and foster personal relationships and empathy development across wealth inequality gaps. As with any innovation, modifications and extensions are continually being developed for MEASURE U.P. and HELP U.P. Since we are not extremely proficient in statistics, economics, business, or even poverty reduction, we cannot guarantee that our methodology is reliable, or that the company’s structure could be sustainably and successfully put into practice. On the other hand, raising individual indicators can only do so much; at the end of the day, any efforts to measure, monitor, and reduce poverty cannot be fully effective without government support. Moreover, occurrences including the status of water on most First Nations reserves are far beyond most of the challenges faced by the urban poor. These incidences must be addressed immediately, and without restrictions. We have proposed possible approaches towards measuring and solving poverty, yet without a collective agreement to implement them, our hands are tied. We hope to continue to expand and develop our ideas in order to create a system in which poverty isn’t only looked at through numbers and statistics, but also through the deficits and the daily challenges that people living in poverty face. We strive to bring our lens of empathy, positivity and understanding to everything that we do, and since MEASURE U.P. is now a published initiative of the Hopelyfe Movement, it is no exception. You can read more about MEASURE U.P. here, and as usual, we would love to receive any feedback you have for us.